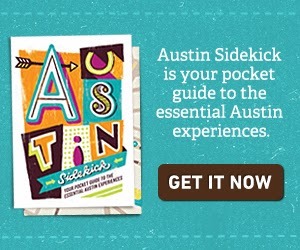 When I talk about estate sales, I try to stick to Austin. But a friendly reader pointed out this estate sale and it might be worth the drive. 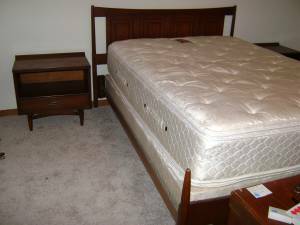 A five-piece Broyhill Sculptra bedroom set is for sale in Friendswood (near Houston from what I'm told). 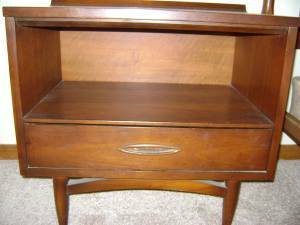 The set includes a mid-century Broyhill Sculptra dresser with mirror; a Broyhill Sculptra bed with headboard, rails and footboard; two Broyhill Sculptra night stands and the ever elusive Broyhill Sculptra Manga dresser. It looks like it's in really good condition. That definitely might be worth a drive. Looks impressive! I remember my parents having one of these in our old house. It's durable and elegant at the same time. Hi Moe. As with all vintage furniture, condition and location are two huge factors. 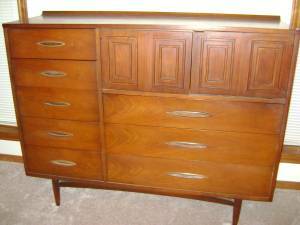 A Broyhill Sculptra set in New York will probably sell for a lot more than one in Oklahoma. And anything that needs to be refinished will drop the price a bit. The best way to track down what you might be able to get is to hit your local craigslist, ebay auctions in your area and estate sales. 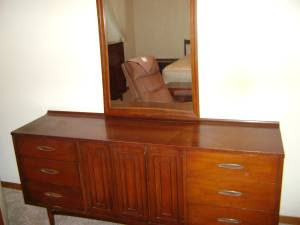 I have the Broyhill Sculptra bedroom set - triple dresser/mirror (same as above), two nightstands, tall bureau and king headboard in great condition. It is located in Queens, NY -- I would love to have an idea of what to sell this for. It was purchased new around 1966 and has been taken care of. Any help would be most appreciated! Midcentury furniture is so hard to price because prices are so local (and if I had to guess, Queens is probably one of the highest markets). are any of these pieces still available for purchase?